Areas with high family poverty rates are particularly at risk, Paulina Gonzalez, executive director of the California Reinvestment Coalition said in a press release announcing the coalition’s action. “Payday and car title loans are advertised as quick, one-time Band-Aids for financial challenges, but the reality is four out of five of their customers get caught in a long-term debt trap,” Gonzalez said. They urged supervisors to follow the example of other municipalities and enact an ordinance to limit the saturation of these types of lenders in low-income communities and communities of color. Not all loans are bad, acknowledged the coalition. Responsible loans from banks and credit unions can help consumers affordably spread out the cost of a purchase or financial crisis over time, but “payday, car title, and installment loans put the majority of consumers in a worse financial situation than they were prior to obtaining these loans,” says the community-based coalition. “Their high interest rates and fees, difficult repayment schedules, abusive collection practices, and lack of adequate underwriting to ensure the consumer can afford payments create a high-cost cycle of debt for consumers,” the group says in its letter to supervisors. Payday loans are small dollar, short-term loans secured by a personal check written from the borrower’s bank account. 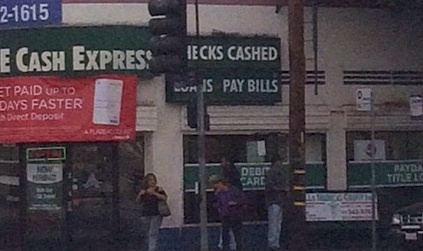 In California, a payday loan can be as much as $300, which includes the fee. At first glance, the loan amount may seem insignificant, but according to data from the state Department of Business Oversight ‘s (DBO’s) most recent annual report, “the average annual percentage rate (APR) for a payday loan in 2016 was 372%, which can cause the amount to spiral out of control. Borrowers who secured car title and installment loans – both of which fall under California’s Finance Lender Law – did not fair any better, according to the DBO. In most cases, borrowers own their vehicle outright and put up the title as collateral. Because there is no interest rate cap for loans above $2,500, monthly payments are often unaffordable and continue for long stretches of time, leading to my car owners losing their vehicles. Earlier this month the DBO reported that over half (58%) of loans between $2,500 – 4,999 carried APRs of 100% or higher in 2016. Interests rate fees generated over $458 million in 2016 for lenders, over half of which came from borrowers whose annual income was $30,000 or less. Seniors aged 62 and older took out more payday loans than any other age group last year, according to DBO data. It’s a scenario Isaias Hernandez, community service director at the nonprofit Mexican American Opportunity Foundation says the organization sees over and over again among its low-income clients. “People take out one loan to help with a financial emergency but instead they’re quickly in over their heads and drowning in fees, collection calls, closed bank accounts and financial heartaches,” Hernandez said. Easy access to the money is a big part of the problem, he says. “If we can limit the number of storefronts, we can make these harmful products less accessible to people in dire financial situations and prevent them from falling deeper into expensive debt that they can’t climb out of,” Hernandez contends. It made it hard to find housing and caused her a lot of stress, Esparza said. The coalition’s letter goes on to criticize state and federal lawmakers for failing to enact strong consumer protections against such abuses. “State legislators do not have the political will to impose limits on these lenders, who have a long history of contributions to political campaigns,” reads the letter, citing as example a California bill that would have restricted interest rates on loans between $2,500 and $10,000 to 24% APR, but failed to gain enough support to advance out of the Assembly Banking Committee last April. 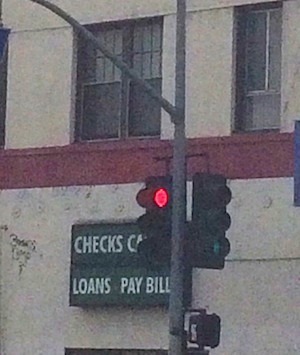 Leticia Andueza, associate executive director of New Economics for Women, said the coalition is concerned that the payday, car-title lenders are “disproportionately located in certain neighborhoods – namely in black and Latino communities. The board can put a stop to our communities being saturated with these financial predators,” she said. —Limit the number of alternative financial services locations allowed within the unincorporated areas of Los Angeles County. —Require conditional use permits for any new alternative financial services storefront locations. —Impose distancing requirements between alternative financial services businesses so that they don’t cluster in low-income communities and neighborhoods of color. —Impose distancing requirements between alternative financial services businesses and other sensitive uses, such as residential areas and liquor stores.